This was posted on August 31, 2006 by Steve Maxwell. Driving back from an errand, Jesse and I saw a traffic stop. Jesse noticed the police officer was wearing a bullet-proof vest. That caused me to think that during trying times like this I’m especially thankful for my Savior, the Lord Jesus, Who is in control and is my Protector. We are less than one week away from a month-long trip to the East Coast. Without fail prior to every speaking trip, it begins to seem like a war zone as problems come in like a flood. If something can go wrong, it will. Instead of stewing over the difficulties, it is far better glorify the Cure. I don’t know how people go through life without the Lord Jesus. All of these challenges are nothing to the God of Creation. As long as we are busy about His business, it is His responsibility to provide the solutions. That is one good reason to be sure we are actually doing His directed work and not following our own paths. That is why Paul could say in Romans 5:3 that â€œâ€¦we glory in tribulations also: knowing that tribulation worketh patience. I dont like the problems, but I see that they are wonderful opportunities to rest and trust in Jesus. They grow my patience as I look to my Lord for His direction. As I encounter them, my children get to see the real dad. Do I fret about the struggles, or do I flee to my Lord? If my responses are godly, my children get the benefit of seeing how Jesus responds to the cries of His children. There is no greater place to learn than in the family. For a month beginning the 6th of September, we will be on the road. If the Lord brings us to mind, we would covet your prayers. First, please pray for the hearts of those we will be speaking to that God would be glorified in each family as they draw closer to Him. Next would be for our hearts that they are upright and clean before the Lord and that we obey the promptings of the Holy Spirit. Finally, for our health and protection along the way. If you are near any of the cities, we would love to meet you. Also it looks like the Lord is putting together a speaking trip to the south Florida to Mississippi the first week of February 2007 and to the West Coast (in particular California) in April/May 2007. It would be a time to meet more of you then. Don’t ever give up but do surrender to the Lord Jesus. Remaining organized as we prepare for a trip is always a challenge. 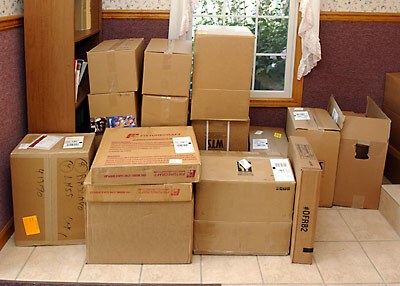 Our small front porch becomes smaller as it fills up with boxes. All of these have arrived in the past few days and need to be processed and prepared for the trip (most are supplies of some sort). John has been working on preparing CD audio albums for the trip (and for Melanie to ship while we are away). 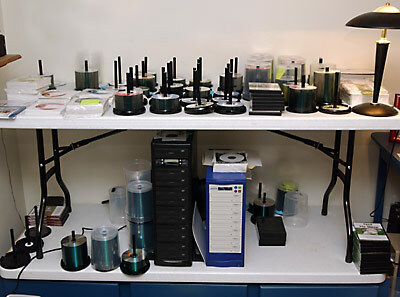 He has already processed many but has a ways still to go… This is his work area. This was posted on August 29, 2006 by Teri Maxwell. As I mentioned last week, we’ve just started our 22nd year of homeschooling. The Mom’s Corner for this month discusses some of the scheduling changes that we’ve made over the past week in starting school once again. Even now, we continue to modify our schedule as our needs change. If you would like to read the Corner online, click for the September Mom’s Corner. To receive the Corners each month via e-mail, click here to subscribe. This was posted on August 29, 2006 by Steve Maxwell. We’ve been sending the September Corner’s over the past few hours. My Dad’s Corner is based upon some of the interactions we had at the County Fair outreach, and also brings up the issue of Youth Mission Trips. If you would like to read the Corner, here is the September Dad’s Corner. If you would like to receive the Corner’s each month via e-mail, click here to subscribe. This was posted on August 25, 2006 by Teri Maxwell. 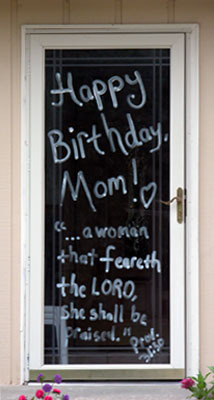 Yesterday was the first day of our twenty-second year of homeschooling. 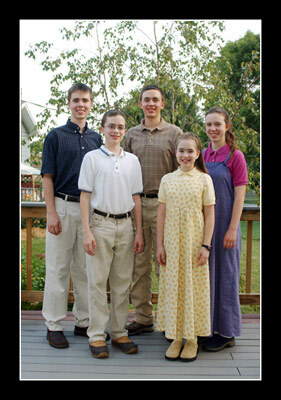 I have five completely different students than I had on that original first day of homeschool in 1985. First-day-of-school photos have been a yearly tradition. Joseph is in 12th grade, John in 10th grade, Anna in 8th grade, Jesse in 7th grade, and Mary is in 4th grade. We have also learned that we have our first-day-of-school the week before we want to begin our academic work. I spent all my scheduled school time meeting with each child, going over his schedule, looking at every book, setting up school notebooks, and evaluating if there was anything else to be done in order to begin our book work. This was posted on August 17, 2006 by Joseph.